Thanks from the Te Waenganui teachers and children. 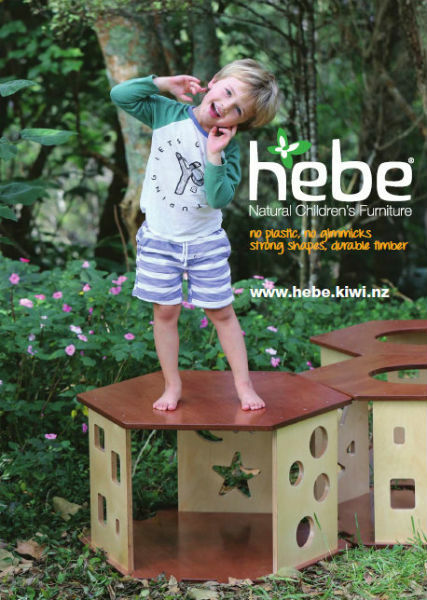 Our centres in Auckland have had a long relationship with Hebe Natural Children's Furniture from the beginning. All of our centres have used Hebe furniture and we are happy with the quality of the products. Also, their customer-focused services that we have received have always been so impressive. Because of the confidence we have in Hebe, we have recommended it to a new childcare centre in Shenzhen, China in 2016. Chinese ECE teachers are so satisfied with the design of furniture and the quality of the products. Craig and his team are always helpful and supportive. We love the gates and so do the families and children. We are very happy with the service and will be returning customers. Thank you. Thank you so much. We love all the furniture, it's awesome. The furniture is so beautifully made, and looks amazing. Hebe was so easy to deal with. I love the fact it is solid, not flat pack, and the communication and service amazing. I will post photos once it is all set up. we are so happy with our new literacy area furniture. Our whanau and wider Kura staff (we are attached to our Kura Kaupapa) love our new furniture! It's amazing how much natural products changes the whole wairua of the place! We (I) got rid of our highlight coloured (pink, green, blue) plastic chairs and tables!!! Great customer service - very patient as I went back and forward amending the invoice, answered multiple little questions as they came up. Items delivered pre-assembled to our gate, securely and protectively wrapped. Quality looks great, and tamariki enjoying the new play space. Thanks Sian for your assistance, and Hebe for your lovely furnishings! We just LOVE our Hebe furniture here at Coast Montessori Preschool. These chairs are a great example......purchased five years ago, used heavily and are still as strong and perfect as when we bought them. Great quality. And our tamariki specially love to use our awesome Hebe easel. Sturdy, functional AND great to look at. Thank you for our tub delivery. The children have been enjoying playing with the objects inside it...the Under two’s teachers and she said its a perfect height for their children. It is very sturdy and solid so the teachers are happy that children are not able to tip it up or climb inside. Thank you once again for a very sturdy tub. We are in LOVE with Hebe Furniture, it's kiddish but without all the brightly coloured plastic!… have the table and chairs plus a couple of mod throne chairs for the princess’s So far they have withstood six months of being attacked by children and still look brand new. We are delighted with our new furniture for the art area and the light box has been a huge success. Thanks for all of your support we love our Hebe furniture!!!!!! Just a quick note to say thank you so much for our beautiful new kitchen and dress up rack - they are fantastic! Tamariki of all ages make good use of the beautiful Hebe bookshelf at Manurewa Playcentre! Even the little ones can help themselves with it's simple & elegant design. Practical and beautiful we love that our Hebe bookshelf can attractively display our books, big books (and children's portfolio books on the other side) all in the one beautiful piece of furniture. Delilah enjoys Hebe’s shape blocks, her favourite thing to do with them is moving them in and out of the handy storage pail. We love how robust Hebe products are and that they are natural timber and not plastic. We ordered a large set of blocks of you. These are fantastic and the children love working with them, in fact we need another set.